Molto soddisfatta!!! Persona molto accogliente e disponibile! Appartement très propre et très bien équipé. Situé à 2 minutes à pied de la plaza Espana. This comfortable and bright, two-bedroom apartment in Barcelona has a cheerful atmosphere and is fully equipped, making it the ideal home-away-from-home. Located near the Fira de Barcelona, close to Plaça Espanya, it offers guests a comfortable stay with such amenities as Wi-Fi access, a computer, a washing machine, a dryer, and both air-conditioning and heating. With maximum capacity of five people, it has two bedrooms, one of them triple (one double bed plus an individual sofa bed) and the other one with two single beds. There is also a sofa bed in the living room. The living room has plenty of light, access to the balcony, and has a TV and DVD player so you can relax after a long day in the city. The kitchen is modern and fully equipped with everything you would need to prepare a home-cooked meal, and there is also a dining table in this fantastic apartment. The bathroom is bright and has a spacious walk-in shower. 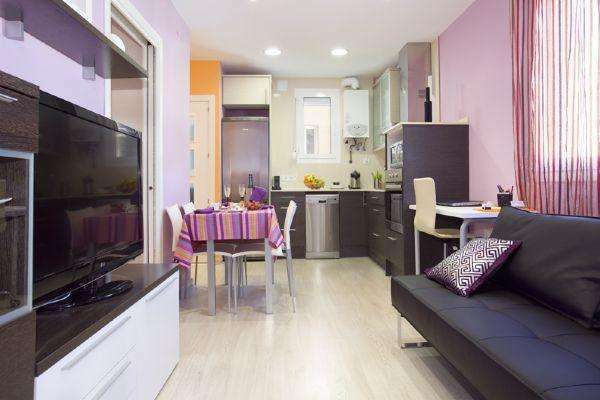 This is an ideal apartment for a family, group of friends or a group of colleagues on a business trip in Barcelona as it is close to the convention center and is very well connected by public transport to the city center.